The Sharpe RatioSharpe RatioThe Sharpe Ratio is a measure of risk adjusted return comparing an investment's excess return over the risk free rate to its standard deviation of returns. The Sharpe Ratio (or Sharpe Index) is commonly used to gauge the performance of an investment by adjusting for its risk., also known as the Sharpe Index, is named after American economist, William Sharpe. The ratio is commonly used as a means of calculating the performance of an investment after adjusting for its risk which allows investments of different risk profiles to be compared against each other. When using the Sharpe Ratio Calculator, a higher value means greater returns for the portfolio relative to the inherent risk, which means a better investment. Because of the simplicity of the formula, the Sharpe Ratio can be used to evaluate a single stock or an entirely diversified portfolio. How to Calculate the Sharpe Ratio in Excel? Firstly, set up three adjacent columns. The first column should have the header “Time Period”, or something similar, to split the returns into its relevant periods. To the right, the second column should have the header “Portfolio Returns” (Rx). The final column should have the header, “Risk-Free” (Rf). In the first column, insert the number of relevant periods that there is available portfolio return data for. Optionally, the type of period can be added. For example, if portfolio returns are sorted by years and there are 4 years available, input “Year 1, Year 2, Year 3, and Year 4” into 4 rows within the first column. In the second column, insert the appropriate portfolio return in percentage for the relevant periods. In the last column, insert the risk-free rate for this particular type of investment or portfolio. The risk-free rate should be the same across all periods. To calculate the Sharpe Ratio, find the average of the “Portfolio Returns (%)” column using the “=AVERAGE” formula and subtract the risk-free rate out of it. Divide this value by the standard deviation of the portfolio returns, which can be found using the “=STDEV” formula. Alternatively, depending on the version of Excel Excel for BeginnersThis Excel for beginners guide teaches you everything you need to know about Excel spreadsheets and formulas to perform financial analysis. Watch the Video and learn everything a beginner needs to know from what is Excel, to why do we use, and what are the most important keyboard shortcuts, functions, and formulasin use, the formula for standard deviation may be “=STDEVA”. While these thresholds are just general guidelines, keep in mind that Sharpe ratios thresholds may differ for investments of particular fields or industries. However, these thresholds are generally accepted, and it is commonly known that any investment or portfolio that returns a Sharpe Ratio of less than 1 is a bad investment or portfolio. 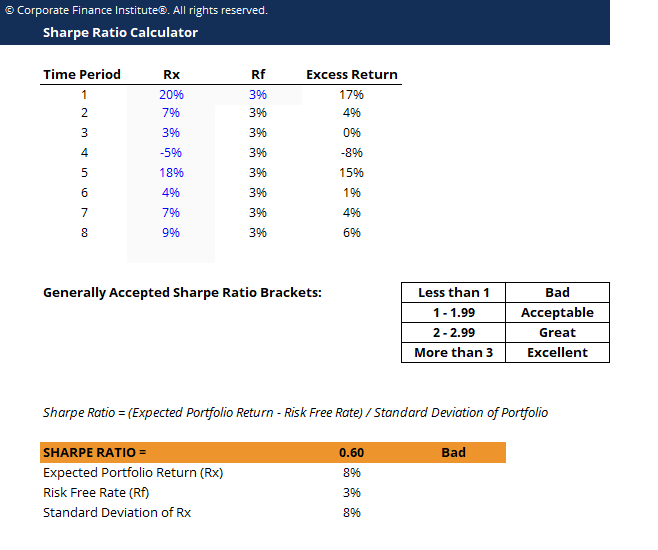 We hope this has been a helpful guide to understanding how to measure risk-adjusted returns with the Sharpe Ratio Calculator. CFI is the official global provider of the Financial Modeling and Valuation Analyst (FMVA)™FMVA™ CertificationThe Financial Modeling & Valueation Analyst (FMVA)™ accreditation is a global standard for financial analysts that covers finance, accounting, financial modeling, valuation, budgeting, forecasting, presentations, and strategy. certification, designed to transform anyone into a world-class financial analyst. Return on EquityReturn on Equity (ROE)Return on Equity (ROE) is a measure of a company’s profitability that takes a company’s annual return (net income) divided by the value of its total shareholders' equity (i.e. 12%). ROE combines the income statement and the balance sheet as the net income or profit is compared to the shareholders’ equity.